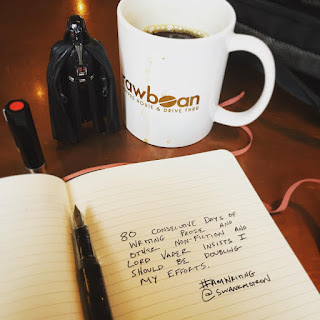 I've challenged myself to writing every day. My writing schedule used to give me weekends off. Or when I didn't feel like it. Or whenever I felt like I was too busy for writing. In recent years I've given myself a day off here and there, but always at least one day off a week. But the more I looked around at successful writers, people who were making a living at it full time, the more I realized that when they said "write every day," what they really meant wasn't "write every business day," or "write every day you can..." They meant "WRITE EVERY DAY." And so I took that as a challenge. I like challenges. It's why I like National Novel Writing Month every year, even though I don't always participate in the way they intended. I just like seeing something I need to update every day with my word count. It keeps my writing every day. I wish someone had a tool of a social website like NaNo's that works all year and tracks your annual word count. I'd find that a lot easier than just keeping track in my book. Today I completed my 80th consecutive day of writing in a row and I'm here to tell you it works. The first while, perhaps the first month, I got a little stressed out about keeping up with a "writing literally every day" schedule. Some days I would sputter in my writing and wonder if I was gaining any actual advantage in keeping my momentum up because I didn't quite feel like I had any. I fought through it, assuming that one month wouldn't give me a fair representation about what writing every day would do. So I pressed forth, right up until Dragon Con. This was my first big test. Do you know how hard it is to find a quiet space to write at a convention as crazy, crowded, and exhausting as Dragon Con? I was convinced I'd break my streak and not keep it up. It was terrifying to me. But I kept my notebook with me everywhere and kept my laptop in the hotel room. I was able to find small spaces in the day here and there to scratch out 100 words here and a 300 words there, adding up to about 1,000 words on the novel over the course of the convention, which is a lot more than I thought I'd get. And I guarantee I wouldn't have got them if I wasn't keeping track of my consecutive days of writing streak. I did it because I challenged myself and didn't want to break it. After the convention, it was much easier to swing back into my writing routine and I was able to get 2,000 words written the morning after I'd arrived home from the convention. And as the days add up, so does my word count. I've finally hit a speed that doesn't make my brain feel like it's going to melt and that average is about 1,750 words a day or so. Some days I get considerably more, some days I get less. After 80 days, though, I've found that hitting a minimum of 1,000 words a day on my novel is no trick at all. Knowing that I'm going to be writing every day gives me permission to create ending points where I know how I'm going to resume the next day. It's gotten me more excited about what I'm writing and it's given me a reason to chew through my story ideas more thoroughly so I know what it is I'll be writing the next day. Surprisingly, it's made me more excited about writing, rather than making it feel like a chore. So, after 80 days, I'd say the experiment has been a wild success. I've written almost 140,000 words, my momentum is only ramping up, and I'm getting a lot done. And it's easier. Writing every day, after that first 30 days, has gotten easier and easier. In fact, it feels like it would be harder to skip it at this point. So I'd challenge you to do the same. Tweet me. Let me know how many days and words you've covered. I'm going to try to make it another 80 (and maybe another 80 after that), though I'm terrified Star Wars: The Force Awakens might derail my plans and distract me. It will be tough, but if you're all participating (those of you who are writers) I'd be encouraged significantly. As some of you may know, I'm a guest at Salt Lake Comic Con and here's my schedule for that show. As far as works published: I have a short story in the Salt Lake Comic Con anthology coming this weekend. It's limited to 500 copies and you'll have to be at the show to get a copy. I also published a piece in Star Wars Insider #160 called Practical Magic: The Surprising Physical Effects of the Prequels. I'm really proud of that piece and you can see a preview of it on StarWars.Com. The latest piece in my Cinema Behind Star Wars column came out as well, and I wrote about Shakespeare in Love, which is one of my favorite films.